I have lived my entire life in and around the City of Detroit. In fact, I was born during its automotive golden years when the “Big 3” car companies (General Motors, Ford Motor and Chrysler) literally drove the economic market here in Detroit. There were no foreign car manufacturers stealing sales and manpower. Even imported foreign cars on the road were rare, and those were owned and driven by only the very rich. Family lines were even drawn down what kind of car you drove – it was not unusual to hear one’s father saying, “We’re a Ford family” or “We’re a GM family”. This meant that the family only drove cars manufactured by that car company no matter how well or badly its cars were in terms of style, cost and performance (overall safety and fuel efficiency were not issues back then). Ours was a GM family; I wondered what my father would think about my current passion for Ford Motor cars and my sister’s Toyota (my other sibling has not strayed from the path, however). But back in 1890, Detroit was yet to be known as the Automotive Capital of the World, although that would quickly change over the next 30 years. By 1920, at least one member of my father’s Dutch extended family (de familie), like many other Dutch immigrant families in Detroit, was or had been employed in one of the many automobile factories throughout Detroit. However, Detroit was emerging as a major manufacturing center in the United States by 1890 (the year that both sets of my great-grandparents would arrive in the United States). By the time of the Civil War, Detroit was becoming less rural and more urban. The population would explode from approximately 45,000 in 1860 to almost 1,000,000 inhabitants (that’s a 2000% increase) by 1920, taking Detroit from the 19th largest city in the USA to the 4th largest city in the country, out-ranked only by New York City, Los Angeles and Chicago. In 1890 there were already 206,000 people crammed within the city limits when my great-grandparents arrived, and that number would more than double in just the next 20 years. The city was definitely having its growing pains. This mass of people in just one city was probably very over-whelming for my father’s paternal and maternal grandparents, despite the overpopulation issues that existed in their homeland when they emigrated from the Netherlands. Almost half (40%) of Detroit’s population in 1890 consisted of foreign-born people, who emigrated from Canada (primarily the province of Ontario), Germany, Poland, Ireland and the Netherlands. The east-side of Detroit where my great-grandfathers, Johannes Reijst and Arie Smouter, would settle their families was predominately first and second generation German immigrants. There was also migration from within the United States to Michigan from the East (Pennsylvania particularly), and to a greater extent from the South (where Blacks and poor Whites were hoping to find better paying job opportunities). In order to accommodate this growing influx of people the city limits of Detroit continued to expand to the southwest, northwest and northeast, annexing many smaller communities in order to grow. The city limits of Detroit covered approximately 13 square miles in 1860; by 1890 the city area more than doubled to 28 square miles, and by 1910 it was almost 40 square miles in size. This rapid growth of Detroit would prove challenging for the city management as it tried to keep pace with the rising needs of adequate housing and public services, such as roads, public transportation, utilities, water and sewerage, safety (police and fire departments), medical facilities and public assistance. So what opportunities attracted all of these people to move to Detroit in the late 1800s? Although the automobile industry did not yet exist, there were many other industries in which Detroit was already taking the lead nationally. Detroit was one of the largest producers of pharmaceuticals, home to Parke-Davis. It had taken over the lead in the manufacture of stoves and furnaces from New York. Situated on top of a salt mine, Detroit would lead in the production of alkalis and other salts. Its prime location on the Detroit River and access to the Great Lakes would create opportunities in ship-building, manufacturer of various hardwoods into end products, and the production of steel used to manufacture rails for the expanding railroads, freight cars (Detroit was the original home to the Pullman sleeper) and streetcars. The city also led in the production of plant, flower and fruit seeds and was among the leaders in the paint and varnish industry. There was a need in the city for craftsmen of all trades (especially masons and carpenters) and vendors of all types of products. So word of these opportunities were spreading not only nationally but also internationally, as many European countries were struggling with difficult economic times. So when my great-grandparents, the Reysts and the Smouters, set foot on Detroit soil, I am sure they envisioned hope, a better means for supporting a family, and also hope for their small children to have more opportunities to succeed in the future. Shortly before I started this quest to discover more of my family’s Dutch heritage, the last of my father’s siblings had passed away. And so also were lost the memories and stories of my father’s family as they journeyed from the Netherlands to Detroit to embark on a new, hopefully richer (not just in terms of wealth) life. Unlike our more recent generations that are more apt to talk about our past, write things down and even immortalize our lives through photos, videos and scrapbooks, my father’s parents and grandparents rarely talked about their life or past. So we are left to wonder and deduce when possible, with the help of some rare photos, as to who they were, what they were like, what they did and accomplished, and whether in any way we are remotely like them. Sadly this week, another of this family has left us at too young an age. So I would like to take a moment to remember those you have journeyed on without us. For a long time I thought all Dutch were Protestants. That misconception was rooted in my own religious experience, living my entire life in Michigan, and my public school education as it related to world history. I had little exposure to world history in school until high school, and even then the Netherlands was only mentioned briefly in regards to the German occupation during World War II, and the subsequent war crime trials held in The Hague. As an avid reader, I gobbled up reading Anne Franks’ Diary on my own accord, and that probably was my first realization that not every Dutchman was Protestant. Somehow, the shelter of my own life as a Dutch descendent in Detroit, led me to believe that the entire homeland had been converted to the Dutch Reformed Church following the Reformation and spread of Calvinism. This was further engrained living in Michigan, where almost all Dutch immigrants and their descendents were Protestant, belonging to one of 3 religious denominations: The Reformed Church of America (RCA), the Christian Reformed Church (CRC), and to a much lesser degree the Protestant Reformed. All of these denominations stem from the RCA. Other than my father’s older sister, who married a Catholic and raised her children in the Catholic faith, I had never met any other person of Dutch descent that was not Protestant. Recently, I learned that there were some Dutch Catholic immigrants that settled in Detroit in the mid-1800s but their number was much smaller in comparison to the influx of Dutch emigrants of Protestant faith. Even my college experience, where I would learn about the Dutch masters and eventually spent three brief days touring Amsterdam did nothing to open my eyes to the diversity of religion in The Netherlands. Then, as I began researching my family tree on my father’s Dutch ancestry side, my curiosity led me to learn more of the region of the Netherlands they emigrated from in the 1800s. My misguided conceptions soon began to unravel, when I first learned that there are now more proclaimed Catholics than Protestants living in the homeland. Next came the revelation that the once dominant Dutch Reformed Church, that was so instrumental in the decision of the first Dutch settlers in Michigan to leave their homeland, was no longer the state church, and in 2004 it actually merged with other Protestant denominations. But there was more…my father’s paternal grandparents had lived in Noord-Brabant, a province which was and still remains today predominately Catholic. So it appears that the Reyst branch of my family tree may not have been Reformed Protestants for as long as I had originally imagined. In fact my 4x great-grandfather is rumored to have been born around 1790 in the village of Holland, near Reusel-de Mierden, located in the very southern part of Noord-Brabant by the Belgium border. It is reasonable to conclude that he may have been Catholic, and either he or his descendents converted to the Dutch Reformed Church after the family settled in Zevenbergen in the 1800s, which is located in the western part of the province, close to the predominately Protestant provinces of Zuid-Holland and Zeeland. But even more enlightening…my great-grandmother, Helena de Reus, was born and lived until about 8 years old in Maastricht, Limburg, which has been predominately Catholic since 400 AD, and likely was raised Catholic. Surprisingly, it is not inconceivable that at one time my ancestors may have participated in the pre-Lenten celebration known as Carnival. Following the Reformation in the seventeenth century, the northern predominately Protestant provinces did away with Carnival. Over time the festivities faded in the southern Catholic provinces, most likely do to pressure from the increasing influential Dutch Reformed Church. However, following World War II, the tradition of Carnival was resurrected, mostly in the cities and towns throughout Noord-Brabant and Limburg, with Maastricht regarded as the top Carnival town. The official start of Carnival in the Netherlands is November 11th (the 11th day of the 11th month) at precisely 11 minutes past 11 (called the “day of fools”) when the Council of Eleven names the Prince of Carnival. Note the significance of the number 11. Thus begins the months of preparations by each municipality. Festivities usually begin on the Sunday (sometimes Friday) before Ash Wednesday. There are parades dotted with floats containing large papier-mache figures, people dressed in bizarre costumes, some wearing painted faces or masks, music (sometimes with quite obscene lyrics), plenty of food, and lots of alcohol. This madness continues until the end of Shrove Tuesday, midnight marks the beginning of Ash Wednesday. During the Dutch Carnival, some towns in Noord-Brabant, even change their name, like Den Bosch; it is known as “Oeteldonk” or “Frog Hill” during the days of Carnival. Like other Catholics around the world, Carnival is a time to indulge on those things that are given up during the 6 weeks of Lent, rich food being one of those forbidden items. It was common for the Dutch to use almonds in lots of recipes during the Lenten fasting period leading up to Easter. Traditionally animal foods were forbidden and almond milk was substituted for cow’s milk. A popular cookie during the Lent was Bitterkoekjes (Bitter Cookies). The name stems from the use of bitter almonds; today they are usually made with bitter almond oil. Each day I learn how different the Dutch are from my childhood preconceptions. There is more to the Dutch then the very private, conservative, hard-working relatives and other church members that I knew growing up. As I listened to the horns blare and the gunshots pop (which our local police force adamantly discourages) at midnight on New Year’s Eve, I wondered why we often refer to this annual celebration as the “ringing in of the new year”. I don’t recall hearing any bells ringing last night. Apparently, the saying refers to an old custom, particularly in England, where the church bells would ring at midnight as a means of ringing out the old year, celebrating its passing, and to ring in the new year joyfully. This ringing of the bells was immortalized by Alfred, Lord Tennyson in his poem “Ring Out, Wild Bells”. All around the world, people celebrated the ringing in of the new year, 2012, in various ways last night. Early in the day, I watched the broadcast from Sydney, Australia as the fireworks lit up the night sky. Here in the United States the main focus every year is on Times Square in New York City where some one million people crowd to watch the famous ball drop to signify the official start of the new year. Even here is Metropolitan Detroit, a new custom started last year with the dropping of the big “D”, a symbol identified closely with Detroit (especially the town’s major league baseball team, the Tigers). For those up to celebrating, there are big parties with bands, noise makers, balloons, and champagne or maybe just a quiet night with close family and friends. The night usually includes special foods, drinks and treats depending on where you live to help bring in that new year. One last splurge before we make those new year resolutions, which usually includes a vow to lose weight by exercising more and eating healthier. My Dutch ancestors also had a special tradition for welcoming in the new year. On New Year’s Eve, a special treat, Oliebollen, was made. Despite efforts to limit the highly fattening sweets in the Dutch diet, this pastry is still popular among the Dutch even today. Oliebollen (which means oil balls) is often referred to as Dutch Donuts. Historians generally credit the Dutch settlers in the Hudson Valley region with the introduction of the first known doughnut recipes in the United States. In fact, in the Hudson Valley in New York State, a doughnut is sometimes called an “olicook”, derived from the Dutch word oliekoeke (oil cake). A traditional oliebol is made with raisins and currants, and sometimes includes chopped apples. The dough is then dropped by spoonsful into hot oil where it is fried until golden brown, then rolled in powdered sugar while still warm. They are believed to symbolize a sweet and everlasting life. So what ever your traditions may be for celebrating the passing of the old year and the hopes for a new year, may they bring you joy, hope, good health and prosperity for 2012. More than any other holiday celebrated here in the United States, the Christmas season affects almost every household, whether of Christian origin or not. Some celebrate it strictly for its religious meaning, most for it non-secular, commercial value. Among these various households, this season is steeped in traditions, some old, some new – from how and when the Christmas tree is decorated, what other holiday decorations will adorn our homes (like wreaths, nativity scenes, nutcrackers, etc. ), what goodies need to be baked and shared, and when and where we will meet with friends and family to celebrate the spirit of this season. Some of these traditions have been passed down through the generations, some have been borrowed from other ethnic cultures, while some have been uniquely shaped by our own individual tastes and personalities. The center of all this holiday glitz is most certainly the brightly lit and decorated, whether simple or lavishly, Christmas tree. 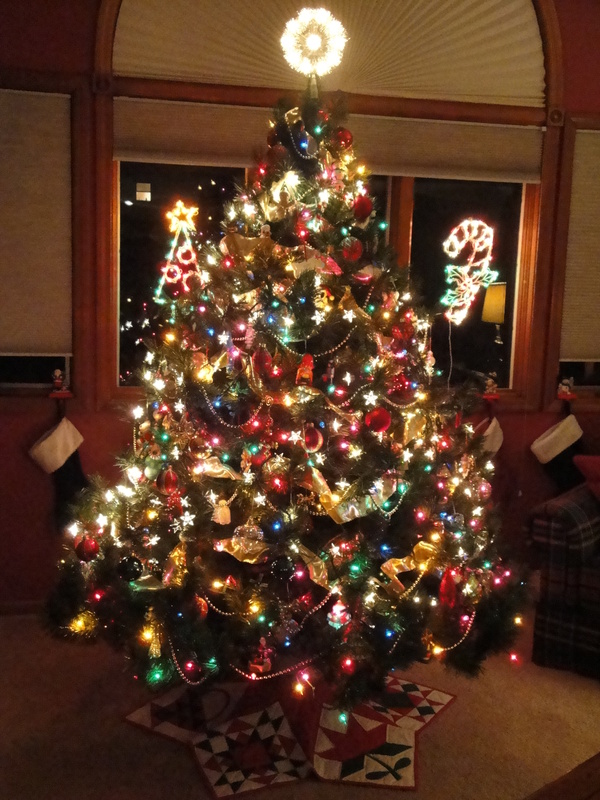 The Christmas tree tradition was borrowed from the Germans. Its current day significance to the Christmas holiday season can be traced back to the 18th century Protestant Germans of the northern Rhine area. That tradition was eventually brought to America by German immigrants of the late 1700s and early 1800s , and began to gain general popularity in the later half of the 19th century. Here in Detroit, there was a large German immigrant community on the east side by the 1880s, and they were likely responsible for its introduction in this area. By 1920, the Christmas tree would adorn nearly every home, including my father’s second generation Dutch household. As a child I remember that the Christmas tree was my father’s main contribution to Christmas. Early in December he would visit the Christmas tree lot located on Gratiot Avenue near Saratoga Hospital and pick out the chosen Christmas tree, usually a Scot pine tree. Arie would bring it home, make a fresh cut in the stump in the garage, then fill a bucket with water and place the tree in it behind the garage. There it would remain until Christmas Eve, when he would bring it inside the house and set it up in the living room, and carefully decorate it with lights and shiny glass bulbs. I never understood why it had to occur on Christmas Eve. For years I thought it had to do with fire safety as Scot pines tend to dry out faster than Douglas fir trees. But his tradition may have been influenced by his childhood memories, as the German families traditionally set up their Christmas tree on Christmas Eve in celebration of Adam and Eve. Harry may not have known this fact, but I am sure his family followed the practices of their neighbors who introduced this cherished tradition. This tradition in our household would end in 1964 with the passing of my father, maybe out of practicality, but maybe more out of grief as this tradition was too tied to my father. It would be several years before we would return to that corner lot to choose a real tree for our house, opting to decorate a small table top tree instead. Today, I no longer make that trip to the Christmas tree lot after several less than memorable moments dealing with real trees. I think it had a lot to do with picking out the “perfect” tree in the dark, clearly not a good idea! One of the first trees we set up in our new home, fell down about an hour after struggling to get it in the stand, luckily it had no lights or bulbs on it yet. It had to be wired to the crown molding in the ceiling. The last real tree we ever had in our house was our oldest daughter’s first Christmas. It was so dry we couldn’t even keep it lit very long on Christmas Day. When it went out the door to the curb a few days later, it was almost bare by the time we managed to shove it out the front door. That tree that looked so green and fresh at dusk on the lot turned out to be spray painted green and would not take up any water, despite a fresh cut. So I had enough of that tradition; the following year we went to the local nursery and picked out an artificial tree. That tree is still assembled each year by me, and over the years has changed its appearance often. The bulbs are mostly red and gold now, and it still has the lighted star at the top, but its the special ornaments that have been collected over the past 25 years that give it meaning . Hanging each ornament brings back so many precious memories, as each such ornament was chosen with a specific meaning in mind. Over the years since my great-grandparents arrived in America, our family’s Christmas traditions have changed considerably. Christmas time that first December here in Michigan back in 1890 for my great-grandparents would have been a time for church and family. The gifts would have been to the church most likely; the Christmas dinner probably a Dutch table – a buffet of cold meats, cheeses, and favorite pastries, like banket. A trip to the nearest frozen pond to ice skate would have been the main recreation. Maybe even a special holiday beverage, non-alcoholic for the children. The Protestant Dutch generally frowned on the drinking of alcohol, but during the December holidays an exception was often made for one special drink. It is the only time of year that I can ever recall seeing my father indulge in alcohol, and it was in strict moderation – a toast to the holiday with family and hopes for a good new year. The wooden shoes set out for Sinterklaas have now been replaced with stockings to be filled by Santa Claus. The gifts are now not just for children but all members of the family, even the family pet. The time with loved ones this year will be too short due to distance and work constraints. Some old traditions will move on, replaced with newer ones to cherish. I hope that you find time this year for both old and new traditions, and to remember all those loved ones who are no longer with us with holiday season. Ik wens je een prettige vakantie (I wish you a happy holiday)! With Christmas just two weeks away, cooks across America are busy stocking their pantries with those special ingredients required for their holiday baking. In fact, the busiest aisle in Meijer (a superstore founded by Frederik Meijer, a Dutch emigrant, in Greenville, Michigan just north of Grand Rapids) this week was the baking aisle, with shoppers piling flours, sugars, mixes, extracts, and colorful decorations into their carts. My great-grandmothers, Helena Reyst and Adrianntje Smouter, were also probably busy this time of year, preparing traditional treats for their families’ celebration of Sinterklaas, Christmas and New Year’s Day. A trip to the market would have included extra eggs, butter and almonds to make holiday pastries and cookies. Speaking of cookies, the word comes from the Dutch word, koekje, which means small baked cake. Cooks would test the temperature of their ovens by placing a small dollop of batter into the oven first before baking their goods. Eventually these small testers would evolve into popular bite-size treats. It is said that the early Dutch settlers in New York and Pennsylvania introduced the cookie to America. Cookies are definitely my passion; I find it extremely difficult to bypass a plate of them. Guess you might say it is in the genes. Growing up we did have two traditional Dutch cookies in our house Dutch windmill cookies and, at Christmas, my mom would make Jan Hagel cookies. Dutch windmill cookies, Speculaas, are a traditional cookie baked during the celebration of Sinterklaas. We are most familiar with these cookies in the shape of windmills. But they can be found in various shapes, the most common being the windmill, Sinterklaas, Sinterklaas on his horse, and Dutch children dressed in traditional Dutch clothing and wooden shoes. Speculaas means biscuit, and it is a crisp, spiced almond cookie traditionally baked in wooden molds. Here in Michigan there are three bakeries that distribute the cookies, Archway (originally founded in Battle Creek, Michigan in 1936, it has been bought out by Lance, Inc. and are now produced in Ohio), Voortman (founded in 1951 in Hamilton, Ontario, Canada by Dutch emigrant brothers and now distributed from Burlington, Ontario, Canada near Toronto) and Steenstra’s (founded in 1947 by the Steenstra family in Wyoming, Michigan and now located in Hudsonville, Michigan just south of Grand Rapids). Of the three, I like the Steenstra’s variety the best as they taste the most like homemade cookies, and is the only one of the three bakeries to make speculaas in various shapes all centered on the tale of Sinterklaas. Here in the Metropolitan Detroit area, all three varieties are usually available at Meijer. If you are really adventurous you can try your hand at making Speculaas. You don’t need wooden molds, a rolling-pin and some holiday cookie cutters will do. But if you want to be authentic you can invest in some wooden cookie molds. Land O’Lakes also offers a slightly different version that you might want to try. Or you might want to try Gevulde Speculaas, which have an almond paste filling pressed between two layers of dough. So this holiday my cookies will include both Jan Hagel and Speculaas cookies in remembrance of my great-grandmothers. I have always been puzzled why we sometimes refer to Santa Claus here in the United States as St. Nick. What does a plump, jolly old man with a white beard, red velvet suit trimmed in white fur, and black boots who rides in a sleigh driven by 8 reindeer have to do with a patron saint? Having been raised in the Protestant Dutch Reformed Church, I had no idea what a particular patron saint stood for as our church generally referred to saints as a collective whole and did not pay homage to any one in particular. Well it appears that our dear Santa Claus was inspired by the Dutch celebration of Sinterklaas, which will occur tonight, December 5th, in The Netherlands. Our jolly elf’s name is believed by many to have been derived from the old Dutch name, Sinter Klaas. There is no direct translation, but “Sint” means saint and “Klas” or Klaase” means class or classroom. Hence the reference to the patron saint of children. In fact, today’s Dutch Sinterklaas (formally known as Sint Nicolaas), although considered a non-secular figure, has his roots in Roman Catholism. Saint Nicholas was a Greek bishop of Myra in Asia Minor (now modern day Turkey). He is best known as the patron saint of children, in addition to the patron saint of sailors and Amsterdam. So it is fitting that our beloved Santa Claus, who loves children, should be named after this saint. There are some similarities between these two figures: both have long white beards, both of their attires are red and white, both love children and reward them for being good throughout the year, and in more modern times both arrive in town in November, being the main focus of a parade. However, the history and cultures of these two countries have shaped the rest of these two holiday icons quite differently. Sinterklaas’s story has evolved from the middle ages, where its roots mired the real saint’s life, and has been changed by the influence of The Netherlands’ changing culture, and particularly its secular and non-secular history. His attire, that of a bishop, dates back to pre-Protestant Reformation times, his arrival from Spain in a steamboat references back to the real Saint Nicholas (whose remains ended up in Bari, which at one time was part of the Spanish Empire; the arrival by steamboat is attributed to an 1800s writer, whose understandment likely refers to the patron saint of sailors), his sidekicks, “Zwarte Pieten”, derive from the Moorish occupation of Spain and also The Netherlands territories in Africa during its Golden Age, and Zwarte Pieten’s representation as bad and evil, likely shaped by the church’s belief that unacceptable behavior would not go unpunished. Our American Santa Claus’s history is much shorter. It is widely believed that he was introduced by the early Dutch settlers in New York and Pennsylvania during the 1600s. But the Santa Claus we know and revere today was largely shaped by the poem “The Night Before Christmas” by Clement Clarke Moore written in 1823 and by cartoonists of the 19th century, particularly Thomas Nast. Our beloved Santa Claus has always been viewed as a strictly non-secular image of Christmas. By the time my great-grandparents arrived in America in 1890, Santa Claus was as much a part of the Christmas spirit as its religious counterpart, the celebration of the birth of Jesus. But the commercialization of Christmas around Santa Claus would have probably come much later, first with the invention of the radio and later the television. So the Reyst and Smouter families likely carried on the tradition of celebrating Sinterklaas on December 5th and 6th for a few years while their children were young. Among the sparse belongings that they brought with them, I am sure there were pairs of wooden shoes that their four small children placed out on St. Nicholas Eve in hopes that they would be filled with candy and small treats in the morning. As a parent I know that I would have told my small children that Santa Claus would find them no matter where we lived in the world, so I am pretty confident that my grandparents and their siblings were also reassured that Sinterklaas would find them in their new homes in America. In contrast to the celebration and gift-giving of Sinterklaas, Christmas Eve and Christmas Day would have been observed strictly as a religious event, attending church and spending time with family. As I child I was fascinated with how different cultures celebrated the holidays. As a mother I had the opportunity to relive that awe through my oldest child, Erin. Every December her third grade teacher would depart from the usual curriculum and dedicate part of each afternoon to student reports on a particular country’s holiday celebration. In addition to the required poster board presentation, which would be proudly displayed on the walls above their lockers outside their classroom door, the children were encouraged to use other visuals as they reported on their chosen country’s traditions. The children bought in traditional holiday decorations, including homemade crafts, and even bite-sized samples of foods traditionally served during those holiday celebrations. Maybe this year, you can take your own children or grandchildren on their own adventure and explore how families elsewhere in the world are celebrating the holidays this year.